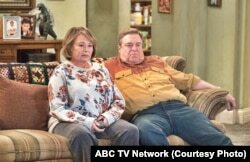 The American television network ABC has canceled its top-rated show, “Roseanne.” The network made its decision shortly after the show’s star, Roseanne Barr, published a racist tweet. Barr made note of Jarrett in answer to Twitter comments about conspiracy theories during Obama’s presidency. Conservative Twitter users had brought up Jarrett as being connected to those conspiracies. Social media users immediately criticized Barr’s tweet. She later deleted it. She also later apologized, tweeting, "I apologize to Valerie Jarrett and to all Americans. I am truly sorry for making a bad joke about her politics and her looks. I should have known better. Forgive me — my joke was in bad taste." Disney chairman Bob Iger supported the decision. He wrote, “There was only one thing to do here, and that was the right thing.” Disney is the parent company of ABC. “Roseanne” is about a working-class family. The series first aired on ABC from 1988 to 1997. It was among the most-watched television shows in the United States during its nine seasons. The latest season of the show was a surprising success. It was the highest-rated and the most-watched series among broadcast networks. The revival had been especially popular with conservative viewers. Barr was the show’s lead writer. She also played the lead character, who was a supporter of President Donald Trump. Hai Do wrote this story for VOA Learning English with additional reporting from AP. Ashley Thompson was the editor. character - n. a person who appears in a show, movie, book, etc.